Another one from me today, this time an old timey Highlander. 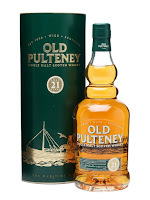 Old Pulteney is known for being good value for money and reviews of the 21yo have been hype-y, but it’s never really seemed to gain the kind of attention of other hyped bottlings. Actually, I find Old Pulteney a bit like Balblair in that it’s all good-great quality stuff but because it’s not a Sherry or peat bomb, no one is going batshit mental over it. I’ve tried the 12 and 17 before but was really looking forward to trying this step up in the range. Nose: Salt, fruit and oak. Lovely balance of flavours. Tropical fruit with pineapple and sweet honey. Taste: A salty nip to start, then softens with mango, pineapple, more salt then with white pepper from the oak. Finish: Medium length. A lot more oak, some spice. A bit overly oaky in the finish. I actually much prefer the 17 year old. This 21 has a lovely nose but the finish is a little too oaky for me. Thanks for reading! Think some Tomatin is up next from me.